Whilst most bears spend their days sleeping or napping and unaware, an epic duel has begun right under their noses between NIBS and MININIBS in the last few weeks. 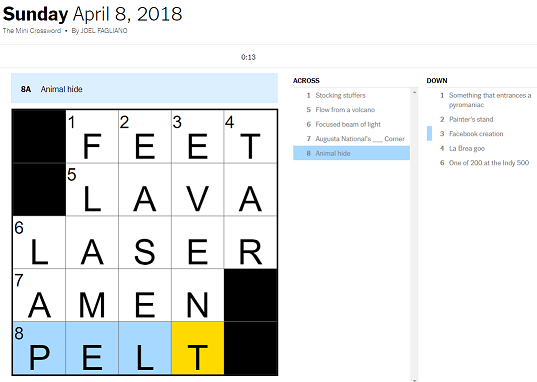 Battling each other for often less than one minute per day... the two go head-to-head on the daily NY Times mini-crossword puzzle. Most often MININIBS is the victor, but every once in a while Nibs pulls off an upset. The problem is that MiniNibs' skills grow with every round and his speed and accuracy get more refined. Nibs does not seem to be keeping pace. Huzzah! Best of luck to you Nibs and MiniNibs! May your skills grow ever faster and may the best small bear win! Posted: Thu May 11, 2017 6:22 am Post subject: Nibs did the unthinkable! Congratulations to my opponent Nibs who had a Mini of the ages last night. Nibs not only broke the daunting 20 second barrier, he blasted past the 15 second barrier as well! It's a record that is likely to stand for some time. It was a bold move to guess "Aries" right off the bat but it paid off! Nibs can't believe it! He is quite certain he'll never do this well again! 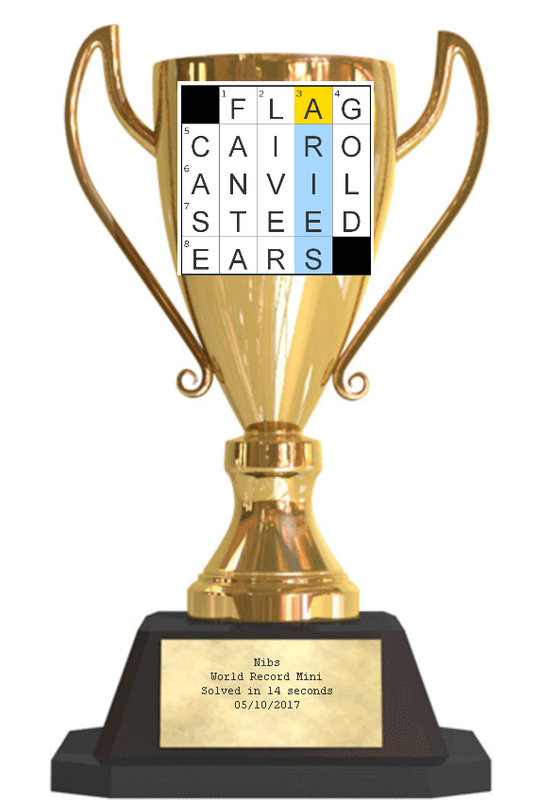 Here is a trophy to commemorate an historic day in Mini battle! Posted: Sat Apr 07, 2018 9:09 am Post subject: Happy Anniversary! Today we celebrate exactly ONE COMPLETE YEAR of tracking the Mini competition via spreadsheet! As we have learned, Lee often loses interest in daily challenges (words-with-fuzz, draw-something, etc) so we are very proud that she has helped me continue to compete daily (although sometimes retroactive when she is traveling) in the mini duel! MiniNibs still continues to be the stronger player but I am holding up pretty well in 2018 so far! We also have fond memories of hanging out at the chicken farm with so many bears last year and doing minis... so proud that we kept the minis going! Huzzah to a year of minis! I can't believe I bested Nibs' amazing 14 second record that has lasted all the way from May! I think I was inspired by going against Nibs on skype and that brought my mini game to a whole new level. Now the race is on for 12 seconds! It has come to my attention that the puzzle I solved in 13 seconds had 2 less letters than Nibs' record puzzle. By my calculations, I average 1.62 letters per second (lps) while Nibs averaged 1.64 lps. Therefore Nibs is still the fastest mini solver in the land! Lee came to visit and we got to do a ton of crosswords together in person - thanks to Lee who has a nytimes subscription. It was a blast! We were dominating the Monday puzzles. Do we all remember when the world was hushed with a 14 second score? And then a 13 second score? And then in 2018 came the unfathomable 10 second score! But this week, the record is shattered once again as MiniNibs dominated with a 9 second mini thanks to SPACE FORCE. Who knew that 9 seconds would ever be possible by bears in our lifetime. Have we reached the pinnacle? It's possible. Regardless, a round of FUZZY APPLAUSE for the CHAMPION OF THE MINIS, MININIBS!!!!!!!!!! Posted: Sat Feb 16, 2019 8:41 pm Post subject: Idea! Can you write a script to count how many wins you and I each had on the minis per year? I want to see if I'm getting better!